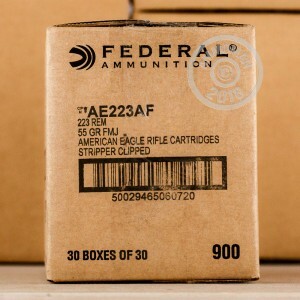 Save time at the range with this case of 900 rounds in .223 Remington from Federal. In addition to containing more than enough ammo for a range trip or two, this ammo comes pre-loaded on 10 round stripper clips for fast mag loading. These clips are compatible with many popular mag designs including Magpul PMAGs and USGI mags. 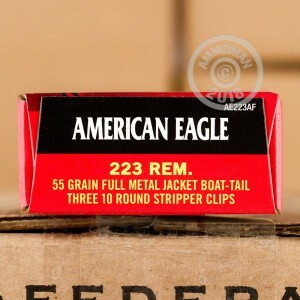 The ammo itself uses a standard 55 grain full metal jacket bullet with a boat tail for extra ballistic performance. Overall, it should perform similarly to M193 ball ammo and deliver the excellent accuracy and clean burning that Federal is known for. These rounds use non-corrosive Boxer primers and reloadable brass cases. 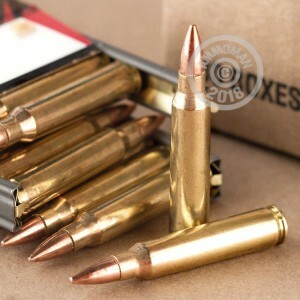 This great deal on 900 rounds is made even better by AmmoMan.com's free shipping policy for all orders over $99. Consider it a quantity discount--the more you buy, the more shipping you save!